Reviewing Authority: Accused denied the specifications as charged. He admitted striking PWs for violations of regulations. He thought he was doing so for their own good: he did not understand the customs of foreigners because of his "incomplete education." Prosecution Arguments: Record is legally sufficient to support the findings. 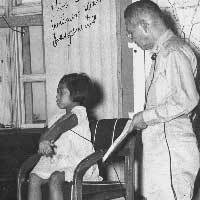 That it was directly ordered that they were ordered to treat PWs in the same manner as in the Japanese Army "does not free this accused from the guilt of his acts." Judge Advocate's Recommendations: Lt. Col. Allan R. Browne found that the sentence of 25 years for the accused, despite havign been convicted of only 1 specification was appropriate because that specification included "many instances of vicious brutalities."